"RIO DE JANEIRO - Gunmen invaded a luxury hotel popular with foreign tourists and took 30 people hostage Saturday but within hours freed the captives and surrendered to police. The 10 who invaded the Intercontinental Hotel were part of a large group of heavily armed, suspected drug-gang members who had become embroiled in a shootout with police outside a large slum near the upscale Sao Conrado neighborhood, a police spokeswoman said. The other suspects fled. "The gunmen were holding the hostages in the kitchen of the hotel, but we negotiated with them," said the spokeswoman, who could not be identified because she was not authorized to discuss the matter. "All of the hostages are freed and 10 suspects are in custody." Police were still searching the hotel to make sure no other gunmen remained inside, she said. One woman was killed during the shootout with police, the spokeswoman said. 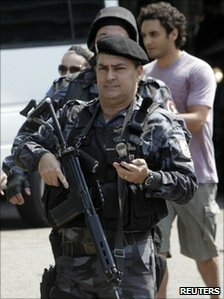 Television images showed an elite unit of Brazil's military police entering the hotel and evacuating approximately 400 guests, many of whom were staying there for a dentists' convention. Spent casings from high-caliber weapons littered the pavement in front of the hotel and residents of the neighborhood said they were awakened by the shooting. Security in Rio de Janeiro is of great concern as the city prepares to host the final of the 2014 football World Cup and the 2016 Olympic Games. Officials have vowed to fight violence, and in the past year started an aggressive program of invading slums where heavily armed drug gangs hold sway, driving them out and creating police posts in those poor communities. The program has managed to clear drug gangs from about 10 slums located in Rio's rich southern zone. The Intercontinental is a favorite among foreign tourists, but the nationalities of those taken hostage was not immediately known." update: the woman who was killed during the shootout was a member of the gang, says the police. The group that entered the hotel was consisted by nine men and a teenager (16) When the shootout began, the robbers were in ten vans and ten bikes. Eight rifles, five pistols and three grenades were apprehended. The police also seized three vehicles. 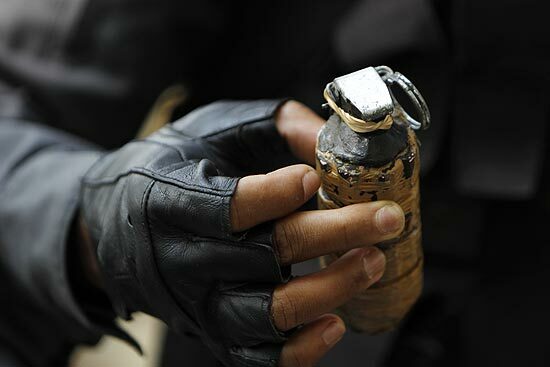 "one of the grenades *un*used by the gunmen"
I can only hope that things will be under control during the world cup (2014). news update: "It seemed as if I was in Iraq," Jose Oliveira e Silva, a resident of the Sao Conrado neighborhood, told the Globo television network. Amateur video aired on Globo showed a group of black-clad police taking heavy fire and returning it as they took cover behind a garbage truck. Sanitation workers in bright orange jumpsuits huddled behind the truck, waiting for the onslaught to end. Globo also broadcast images of the shooting victim's body, which lay on the street partially covered by black plastic sheeting. Another witness, Ricardo Valladares, told Globo: "We are all frightened to death. No one is leaving the building because we don't know if there are more criminals nearby." Seems kind of weird they would just surrender to the authorities like that. They must have got some concessions but the article doesn't indicate this. Commissar MercZ;5380839Seems kind of weird they would just surrender to the authorities like that. They must have got some concessions but the article doesn't indicate this. "The 10 who invaded the Intercontinental Hotel were part of a large group of heavily armed, suspected drug-gang members who had become embroiled in a shootout with police outside a large slum near the upscale Sao Conrado neighborhood, a police spokeswoman said. The other suspects fled." there were too many cops, they didn't have any other choice. Besides, they hadn't planed on taking hostages in the first place. hulde gran;5380840 there were too many cops, they didn't have any other choice. Besides, they hadn't planed on taking hostages in the first place. I know, but the article doesn't say exactly for what they managed to agree to, beyond not getting killed. The BOPE, an elite group of the brazilian police, negotiated the surrender of the criminals and the release of the hostages, who were concentrated in the kitchen. The mother of one of the bandits, a resident of Rocinha (one of the infamous favelas), came to be called to convince her son to surrender. "I asked, but he would not listen," she said, crying a lot at the hotel door. The hotel manager, Michel Chertouh, said there were about 1,500 people, including guests, staff and participants of a congress of dentists at the time of invasion. The bandits were calm, but threatened the hostages. Cops injured four police officers were wounded during the operation, the condition is more serious with Sergeant Paiva, who was shot in the knee and is being operated at the Hospital Miguel Couto. The others were hit by bullets in the forearm and hands and are well. I know it doesn't really say what the agreement was, but it's kinda obvious now that after the shootout the bandits discovered they had no chance other than surrendering. Most they got away with was their lives then, but this means a long time in the slammer anyways. Though certainly media outlets will go with this, particularly a certain country that felt shafted for losing the 2016 Olympics. Commissar MercZ;5381009Most they got away with was their lives then, but this means a long time in the slammer anyways.